Evening Dress. A dress of white taffety, with two flounces, cut in indented scallops, and edged with branches of green foliage, in embroidery. Over the upper flounce is a double row of the same foliage, worked on the dress; and the upper flounce is headed by a silk cordon of white and green. The body is made slightly en gerbe; a pointed pelerine-collerette of crépe-lisse covers the bust, trimmed round with a ruche of tulle, and surmounted near the throat with a full narrow ruff of the same. The sleeves are of crepe-lisse, long and full, and have a narrow mancheron of embroidered taffety, the same as on the edge of the flounces, and consisting of one simple row of indented scallops. On the wrists are two odd bracelets; on the left arm, next the wrist, is one very broad, of white and gold enamel, fastened by a cameo; over that a bracelet formed of two gold chains, clasped with a white agate. On the right arm are two bracelets, close together, of gold lace, on which are sewn bright garnets, and these are clasped with white agate. 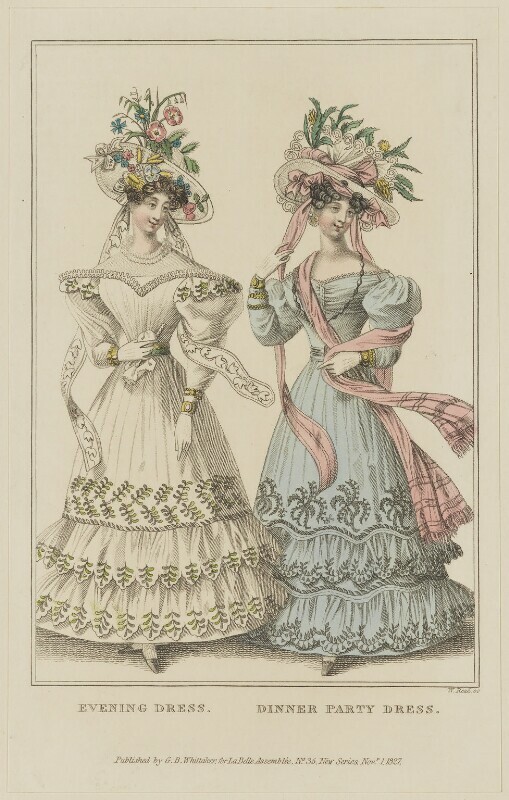 A dress-hat is rather profusely ornamented with a variety of field flowers, some of which are under the brim, on the hair: the hat is of white crape, and has long strings, floating loose, of brocaded white gauze ribbon. A belt of shaded green ribbon encircles the waist, and fastens behind with a gold buckle. The shoes are of black satin. Dinner Party Dress. A dress of celestial-blue gros de Naples, with two flounces, slightly festooned, scalloped, and embroidered at the edges with dark blue. Dividing each flounce, and over the upper one, is a rick silk twisted cordon of light and dark blue: the whole surmounted by elegant bouquets of foliage in dark blue. The corsage, à la Sévigné, with full long sleeves, fastened on the left arm, next the wrist, by a broad bracelet of gold, with an antique intaglio head; above that a single gold chain. On the right arm are three bracelets; that next the wrist of white and gold enamel, with a cameo-head. The other two consist each of two rows of gold heads, fastened with a brooch of pearls. Over the bust is thrown an amulet-chain of Egyptian pebbles and large gold beads. The dress-hat is of white, transparent, stiffened net, trimmed with pink striped ribbon, gauze, blond, and Indian flowers. A bow of pink ribbon is placed over each temple, under the brim, and the strings float loose.